The mission of the Judicial Department is to provide a constitutional and statutory medium for the enforcement of traffic offenses, municipal ordinance violations, and State misdemeanors adopted by municipal ordinance as offenses against the Town of Notasulga. -Providing adequate personnel with all employees, other than the Judge, being state certified magistrates. -Ensuring that no warrants of arrest are issued before probable cause is established to support the warrant. -Ensuring that no person is deprived of his or her liberty or property without due process of law. -Providing court administration to guarantee that all persons coming before the Court are treated equally and have protected rights afforded them under the United States Constitution, the Alabama Constitution, and all applicable ordinances and statutes. Upon entering the Municipal Court area, you will be subject to a search of your person and your belongings. This is carried out via a walk-through metal detector for your protection. If need be you may also be searched with a handheld metal detector and/or an actual physical pat down. The following items will NOT be allowed past the security check point (and possession of some will result immediate arrest): Firearms-Knives-Mace/Pepper Spray- Alcohol or Drugs- Clothing with Lewd or Suggestive Writing or Images. To ensure a quick and smooth entry into the court area you should not have any of the items listed above. You will not be allowed to leave prohibited items at the security check point. You must leave prohibited items in your vehicle. This is for your safety and the safety of others. 1. Can someone else come and pay a ticket for me? No, the magistrate must witness your signature on the Waiver of Rights on the back of the citation. 2. Can I drop a warrant? Once a warrant has been signed and issued, it cannot be dropped for any reason. Everyone must appear in court to settle the matter. 3. Do I need to bring money to court? At court, you will be expected to pay for all fines and court cost assessed by the judge. 4. What can I do if there is a warrant for my arrest? In order to take care of an outstanding warrant, you must turn yourself in to the Notasulga Police Department. After the warrant has been processed, you will be given an opportunity to post a bond and you will be given a court date. For further information contact the Notasulga Municipal Court at (334) 257-1454. 5. What will the exact amount of my fines be at court? The municipal Judge will establish the amount of the fine for each offense at court. Depending on the charge, the Judge may place a maximum fine of $500 plus court cost. There are some charges that the Judge can charge a much higher fine. COURT IS EVERY THIRD TUESDAY OF THE MONTH @ 09:00a.m. Q: Do I have to come to Court? A: If you have received a routine traffic citation (Speeding, Running a Stop Sign, etc. ), you may pay your ticket prior to your court date and avoid coming to Court. If you are charged with a Misdemeanor (Harassment, Possession of Marijuana, Theft of Property 4th Degree, etc. ), a violation that carries the possibility of jail time (Public Intoxication, Disorderly Conduct, etc. ), or a serious traffic offense (DUI, Driving While License Suspended, etc.) you MUST come to your court date. Q: How can I pay my ticket prior to my court date? A: If it is a non-serious traffic violation or a Uniform Non-Arrest Citation, you can pay your ticket prior to your court date: in person at 76 West Main Street, between 8 a.m. and 5 p.m., Monday through Friday, Wednesday 8 a.m. to 12 p.m. with cash, Money Order, debit or credit (https://notasulgaal.govtportal.com/) or a Certified Check (no personal checks); or (d) through the mail to PO BOX 207, Notasulga, AL 36866 by Certified Check or Money Order. 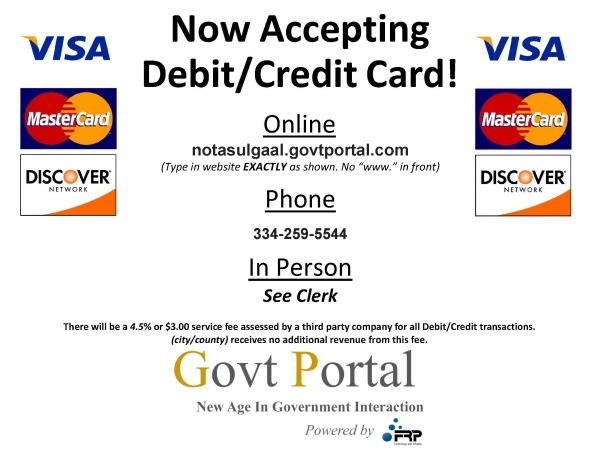 All Certified Checks and/or Money Orders must be made payable to Notasulga Municipal Court; do not send cash or personal checks through the mail. If you send a Certified Check or Money Order in the mail, please follow up to ensure it has been received and properly applied. Q: What if I can't pay my ticket(s) in full prior to or on my court date? A: If you want to plead guilty and pay your fines and court costs, but are unable to pay them in full prior to or on your court date, you may enter a guilty plea(s) with the Judge and you will be placed on a Payment Plan, giving you at least ninety (90) days to pay. You will also be given a subpoena for a Payment Review Date that you must appear for unless the fines and costs are paid in full. Q: How can I get a court-appointed attorney? A: If the offense you are charged with carries the possibility of a jail sentence, you may request a Public Defender on your court date. The Judge will make a determination of eligibility, based upon financial need. The Court uses the State of Alabama's indigency form, which is attached here (http://dhr.alabama.gov/services/Child_Support_Services/Documents/379031ALAUJS%20C-10%20Affidavit%20of%20Substantial%20Hardship%200295.pdf). . If you would like to apply for a Public Defender prior to your first court date, you may complete both sides of the form and sign it in the presence of a Magistrate at the Clerk's Office. Q: Can I change my court date over the phone? A: As a courtesy, the Notasulga Municipal Court allows you to change your original court date once. However, you must appear in person at the Clerk's Office at 76 West Main Street and sign for a new subpoena in order to change your scheduled court date. If you miss your original court date, we will send you a second court date as a courtesy. This second notice will be sent to the address we have on file for you; if you do not appear at that second court date, a Writ for your arrest may be issued and/or your driving privilege and license may be suspended. Q: Can I go to driving school or otherwise keep a ticket off my record? A: Driving school is typically at the discretion of the Court. However, if this is your first moving violation within the Town of Notasulga, the Court will generally allow you to complete an in-person traffic safety program or online class . Upon completion, the citation will be Nol Prossed. The Court reserves the right to deny your application for the program based upon your statewide or nationwide driving history, even if it is a first offense in this jurisdiction. Additionally, individuals with CDL's are not eligible for this program. If you are eligible for and interested in completing, please contact a Magistrate at least ten (10) days before your scheduled court date. Q: Where is Court held? A: Notasulga Municipal Court is held inside the Notasulga Council Chambers located at 76 West Main Street, Notasulga, AL 36866. Q: What time does court start? A: Most court sessions start at 9:00 a.m.
Q: Can I bring my children with me to court? A: In order to maintain quiet and order in the courtroom, children under the age of twelve (12) are not allowed. If you are unable to arrange for childcare, you may wait in the lobby until your case is called. Q: If I have to come to Court, what should I wear? A: Citizens should dress appropriately for all Court appearances. Q: What should I expect to happen on my court date? A: On the original court date (in the bottom left hand corner of your ticket or on your Bond paperwork), you will check in at the Clerk's office, where you will be asked how you intend to plead. Once court begins, all those pleading not guilty will be called before the Judge in the order they checked in. If you are pleading not guilty, the Court will first inquire if you want a lawyer. If the charge carries the possibility of jail time, and you want a lawyer but cannot afford one, you will be given an economic form to determine your eligibility for a Public Defender. Those pleading not guilty will then have their case set for trial on a later court date. If you are pleading guilty, you will be called up before the Judge and offered the Right to Counsel and/or a Public Defender, if applicable. After your guilty plea is accepted, you will be allowed to tell the Court anything you'd like in mitigation of your sentence, at which time the Court may assess fines, court costs, counseling, and/or a jail sentence in accordance with State law. Q: I missed my court date(s) - what happens now? A: If you missed your first court date, your case has been continued as a courtesy, and notice of a new court date has been mailed to the address of record in the Clerk's Office. You must appear at that rescheduled court date. If you have failed to appear at multiple court dates, or missed a trial setting, a Writ for your arrest may be issued and, if the underlying charge was a traffic offense, your privilege to drive/driver's license may be suspended. Q: There is a Warrant for my arrest - what do I do now? A: If a Warrant has been issued for your arrest, you must surrender yourself to either the Notasulga Police Department at 76 West Main Street, Notasulga, AL 36866 and post the appropriate bond. 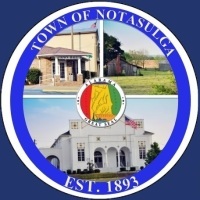 You may use any of the bond types permissible in the Town of Notasulga (which are Surety bond or cash bond), except you must post a cash bond for Failure to Appear. You will be issued a new court date upon your release. Q: How do I contact my Court Referral Officer? A: The Court Referral Office is located at 206 N Main Street, Tuskegee, AL 36083 , or can be contacted by phone at (334) 724-2533. Patricia Parham, 209 N Main Street, P.O. Box 830106, Tuskegee, AL 36083.